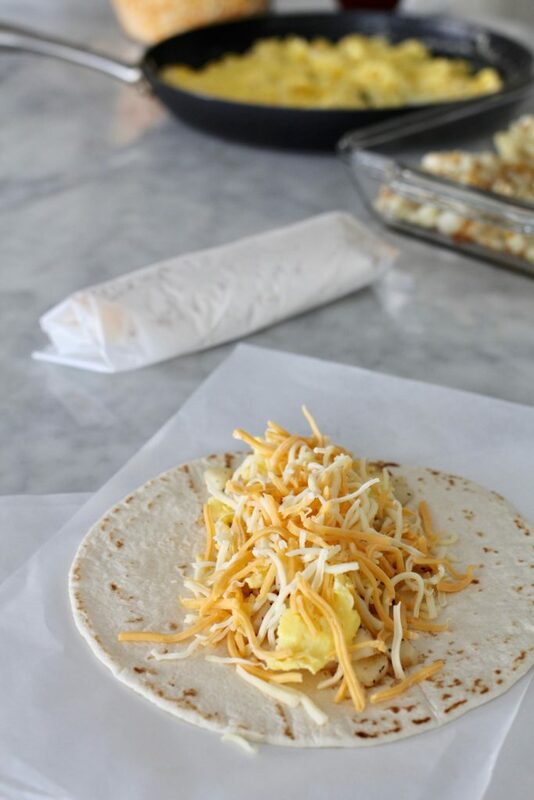 ABK’s quick and easy breakfast burrito saves the day when it’s time for breakfast on the go! Perfect for eating on the spot, or freeze and heat later for grab and go convenience. When I was growing up, we were only allowed to eat cold cereal once a week. Yes, one time a week. Cereal would last for WEEKS in our house! It was eggs, potatoes, ham, toast and oj for us most mornings. Once in a while my mom cooked oatmeal (not my favorite) for breakfast. My parents were big on eating a hot breakfast to start the day, every day. Those were more simple and laid back times…Now it seems like everyone’s in a hurry, and breakfast is the last thing on our minds when we run out the door. A little advance planning can turn breakfast into more than an afterthought. ABK’s breakfast burrito makes this a meal you won’t want to skip! My kids and Grant love a traditional cooked breakfast. This breakfast burrito combines eggs, cheese, hash browns and tortillas for the most quick and easy breakfast. I’ve been making breakfast burritos for years, mostly in a casserole form, which is then baked for a crowd (perfect for Girl’s Camp or a family reunion). You can also follow this recipe and place all of the rolled burritos in a pan to be baked in an oven if you’d like. 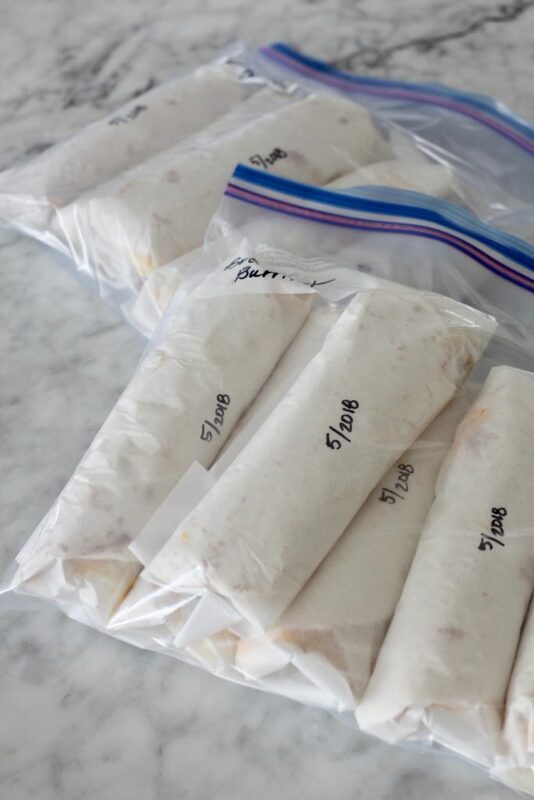 This method allows breakfast burritos to be individually wrapped for a quick breakfast on the go! 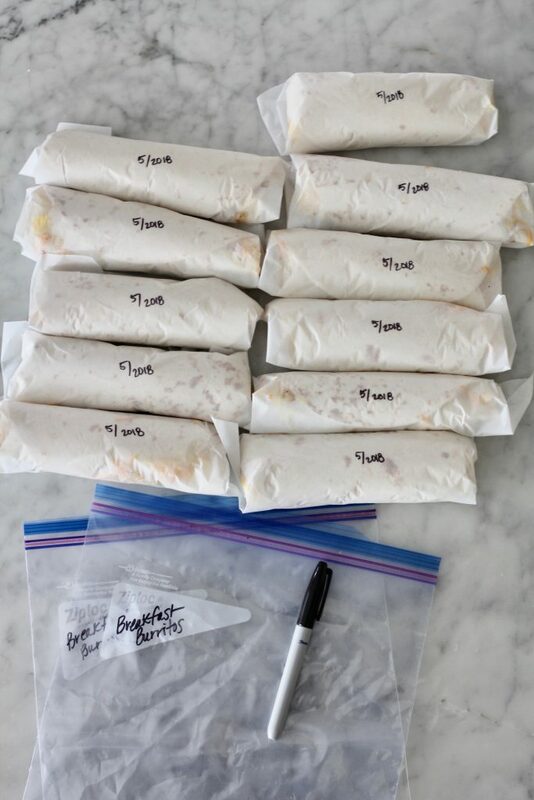 A few years ago, my friend Tiffany explained how she lets her kids make breakfast burritos so they can have a do-it-yourself breakfast before they go off to school in the morning. I love the idea of letting the kids get involved in making this recipe! Kids are ALWAYS more willing to eat food they have helped make. I’ve included instructions for rolling and freezing which would be a great project for kids of all ages. Follow the helpful hints in the recipe for the best results when freezing and heating to eat later. This recipe is the most basic form of a breakfast burrito and can be altered to your liking! If you like your eggs spicy, add some seasonings or a little bit of Tabasco to turn up the heat. Cooked onions and peppers add lots of flavor to the eggs as well. Make sure to pre cook everything to insure the burrito won’t become soggy during the reheating process! I like to add salsa after heating up, again to make sure I don’t end up with a watery breakfast burrito! This recipe is meatless, but chopped ham, bacon, sausage or chorizo may be added after the eggs are scrambled to make this a bit more substantial. Grant loves sausage on his breakfast burritos. Salsa is a must have for me, served on the side or spooned into the breakfast burrito after I’ve heated up in the microwave. Turn griddle or heat on stove to medium-high and place about 2-3 tablespoons oil, or a combination of oil and butter into the pan. 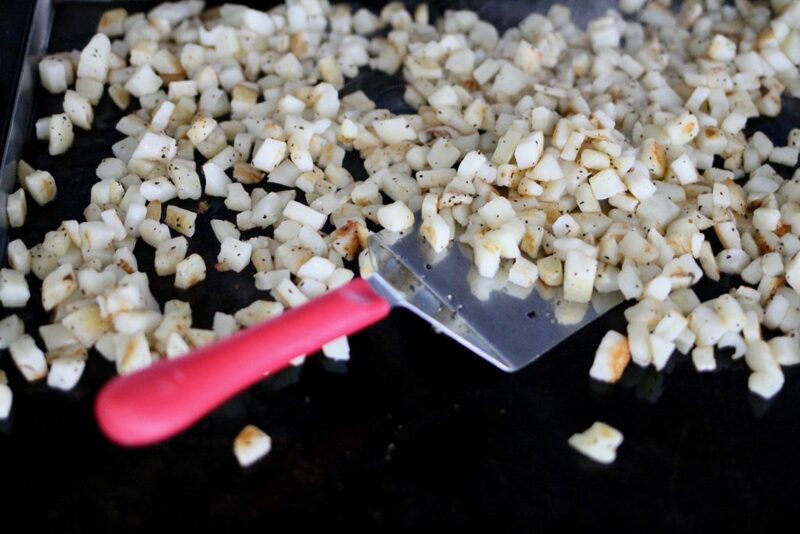 Once melted or sizzling, add frozen hash browns or grated potatoes, cook until golden about 10-15 minutes. Remove from stove and set aside. Make sure hash browns are completely cooked, almost overcooked to prevent the potatoes from giving off liquid when re-heated. Whisk eggs in a bowl or blender. Heat non-stick pan over medium heat and add 2 tablespoons butter. Pour eggs into pan. Season with salt and pepper. Cook just until eggs begin to set, using a spatula to draw eggs across pan once every 15-30 seconds. Don't "chop" the eggs into little pieces. Large pieces of egg "curd" is what you're looking for. Cook until the eggs are almost set. Remove from heat when the eggs are still slightly wet. They will continue to cook in the pan after removed from heat! When ready to use, place in microwave (keep parchment wrapper on) and microwave for about 1 minute, if frozen, I microwave for about 1 minute 30 seconds. Serve immediately with salsa if desired. I prefer Mission brand Soft Flour tortillas for this recipe. They are soft enough to wrap without preheating and reheat without falling apart. Usually, I prefer to grate my own cheese, but have found pre-grated cheese works a bit better in this recipe. 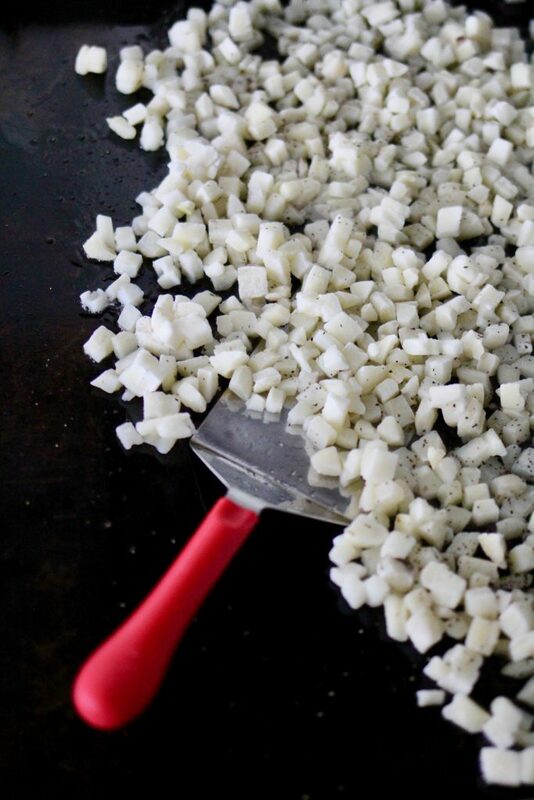 The bagged, pre-grated cheese is drier than grated block cheese and holds up better in the freezing and reheating process. This recipe makes 10-12 breakfast burritos depending on size of eggs, tortillas and amount of hash browns used. 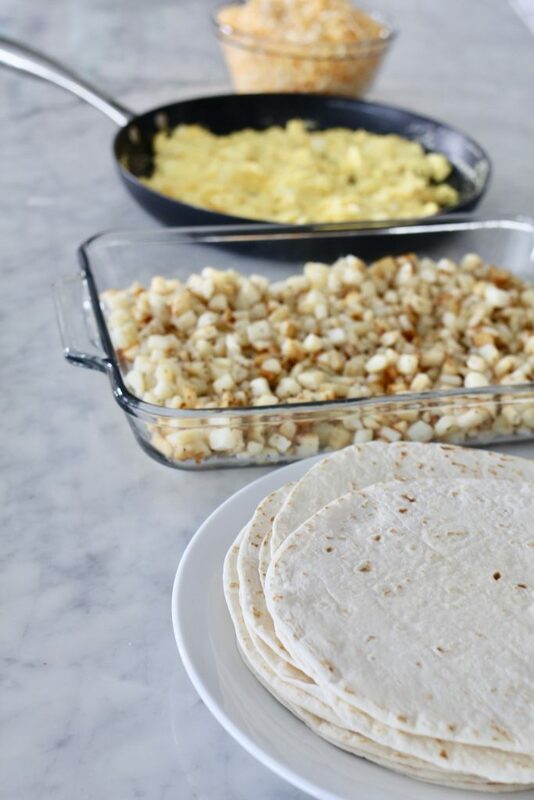 If you are placing in a pan to serve a group on plates, spray the pan lightly with cooking spray, place the rolled breakfast burritos in the pan and cover with foil. Do not wrap individually. Remove from fridge about an hour before heating up. Heat in a 325 oven for about 15-20 minutes, covered. Check to make sure tortillas in middle are warmed. Serve immediately. Thanks for this I am homebound now that I am older. I love this. I can make them and have a take out breakfast. I think you will love this recipe! It’s quick and easy and so convenient to pull out of the fridge when you want to have a hot breakfast. Are the hash brown potatoes in these pictures homemade or store bought? If you bought them at the store, what brand are they? I like this Home style type (not the shredded type hash brown). Thanks!! They are store bought. I believe I usually purchase the Ore-Ida brand, but have also used other brands. I just look for a product that doesn’t have much added to the potatoes! I’m going to try these at camp! Do you use burrito size tortillas or just regular? Thanks so much! Laura, I usually use regular 8 inch sized tortillas. These burritos would be perfect for camp! How long would they keep in freezer? I am thinking of making them this summer for us to eat once school starts. I would love other ideas for bkfast that can be make in advance. Thanks! Hi Nadine, they’ll keep in the freezer for about a month. That’s a great idea to make them ahead for the school year! The Peanut Butter Banana Power Muffins or Fresh Blueberry and Greek Yogurt Muffins would also be good to make ahead and freeze. Hope this helps and thanks for reading ABK.